Chapters 1 through 3 actively present the reader with a burning platform. The plant and division are failing. Alex Rogo has actively pursued increased efficiency and automation to generate cost reductions, however performance is falling even further behind and fear has become central feature in the corporate culture. Chapters 4 through 6 shift the focus from steps in the process to the process as a whole. Chapters 4 – 6 move us down the path of identifying the ultimate goal of the organization (in this book). The goal is making money and embracing the big picture of systems thinking. In this section, the authors point out that we are often caught up with pursuing interim goals, such as quality, efficiency or even employment, to the exclusion of the of the ultimate goal. We are reminded by the burning platform identified in the first few pages of the book, the impending closure of the plant and perhaps the division, which in the long run an organization must make progress towards their ultimate goal, or they won’t exist. Chapters 7 through 9 show Alex’s commitment to change, seeks more precise advice from Johan, brings his closest reports into the discussion and begins a dialog with his wife (remember this is a novel). In this section of the book the concept “that you get what you measure” is addressed. In this section of the book, we see measures of efficiency being used at the level of part production, but not at the level of whole orders or even sales. We discover the corollary to the adage ‘you get what you measure’ is that if you measure the wrong thing …you get the wrong thing. We begin to see Alex’s urgency and commitment to make a change. Chapters 10 through 12 mark a turning point in the book. Alex has embraced a more systems view of the plant and that the measures that have been used to date are more focused on optimizing parts of the process to the detriment to overall goal of the plant. What has not fallen into place is how to take that new knowledge and change how the plant works. The introduction of the concepts of dependent events and statistical variation begin the shift the conceptual understanding of what measure towards how the management team can actually use that information. Chapters 13 through 16 drive home the point that dependent events and statistical variation impact the performance of the overall system. In order for the overall process to be more effective you have to understand the capability and capacity of each step and then take a systems view. These chapters establish the concepts of bottlenecks and constraints without directly naming them and that focusing on local optimums causes more trouble than benefit. Chapters 17 through 18 introduces the concept of bottlenecked resources. The affect of the combination dependent events and statistical variability through bottlenecked resources makes delivery unpredictable and substantially more costly. The variability in flow through the process exposes bottlenecks that limit our ability to catch up, making projects and products late or worse generating technical debt when corners are cut in order to make the date or budget. Chapters 19 through 20 begins with Johan coaching Alex’s team to help them to identify a pallet of possible solutions. They discover that every time the capacity of a bottleneck is increased more product can be shipped. Changing the capacity of a bottleneck includes reducing down time and the amount of waste the process generates. The impact of a bottleneck is not the cost of individual part, but the cost of the whole product that cannot be shipped. Instead of waiting to make all of the changes Alex and his team implement changes incrementally rather than waiting until they can deliver all of the changes. Chapters 21 through 22 are a short primer on change management. Just telling people to do something different does not generate support. Significant change requires transparency, communication and involvement. One of Deming’s 14 Principles is constancy of purpose. Alex and his team engage the workforce though a wide range of communication tools and while staying focused on implementing the changes needed to stay in business. Chapters 23 through 24 introduce the idea of involving the people doing the work in defining the solutions to work problems and finding opportunities. In Agile we use retrospectives to involve and capture the team’s ideas on process and personnel improvements. We also find that fixing one problem without an overall understanding of the whole system can cause problems to pop up elsewhere. Chapters 25 and 26 introduce several concepts. The first concept is that if non-bottleneck steps are run at full capacity, they create inventory and waste. At full capacity their output outstrips the overall process’ ability to create a final product. Secondly, keeping people and resources 100% busy does not always move you closer to the goal of delivering value to the end customer. Simply put: don’t do work that does not move you closer to the goal of the organization. The combination of these two concepts suggests that products (parts or computer programs) should only be worked on and completed until they are needed in the next step in the process (Kanban). A side effect to these revelations is that sometimes people and processes will not be 100% utilized. Chapters 27 and 28 shows the results of focusing on the flow of work the bottleneck and only beginning work when it will be needed has improved the results at the plant, Bill Peach pushes Alex for more using the threat of closing the plant as the stick to make the threat real. Johan suggests cutting batch sizes in half as a way to improve performance and urges Alex to let the sales team know the plant can deliver quickly and quality. Chapter 29 and 30 show that the plant has been able to deliver on the huge order from Bucky Burnside, the company’s largest customer, without impacting other orders or sacrificing quality. In order to meet the new demands on the plant, they reduced batch size again, which improved flexibility and efficiency. Burnside is so thrilled with the results and the staggered delivery schedule he flies to the plant to shake the hand of every production worker. Jons, the head of sales, confides to Alex that the success has led to the promise of even more business from Burnside. Despite all of the success, it is time for the plant review. Chapters 31 and 32 deal with the plant review and the review’s immediate aftermath. Alex defends the changes he and his team have made to how work is done in the plant. 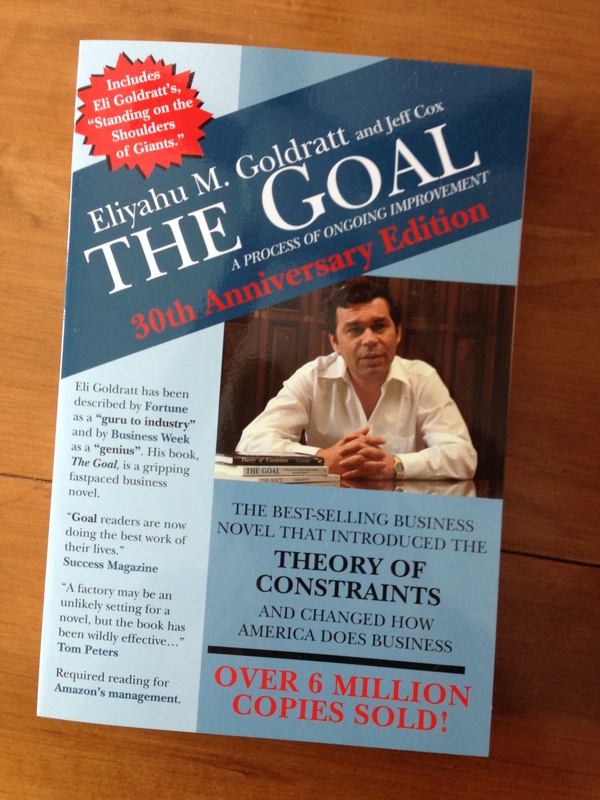 The defense includes a summary of the theory of constraints. While Hilton Smyth is hostile, Alex’s performance has been noticed and Bill Peach tells him that he is to be promoted. Alex immediately reaches out to Johan who tells him that in the future he will need to trust his own judgement. Chapters 33 and 34 reflect a shift in focus. With the plant saved, Alex is faced with a need to generalize the process that was used so that it can be used for different problems or scaled up to the next level based on his promotion. The problem is that finding a generalized process is hard and unless Alex and his team can find a way to generalize what they have done it will be difficult to replicate across the division. Find the bottleneck in the flow of work. Decide how to “exploit” the bottleneck (make sure you maximize the flow through the bottleneck). Subordinate every other step to the bottleneck (only do the work the bottleneck can accommodate). Elevate the bottleneck (increase the capacity of the bottleneck). If the bottleneck has been broken repeat the process (a bottleneck is broken when the step has excess capacity). As chapter 36 concludes the team reflects that the word bottleneck should be replaced with the slightly broader concept of constraint. Chapters 37 and 38. Alex and his team continue to struggle to answer Johan’s final question. During their discussions Alex and his team find that the plant has 20% extra capacity. With the understanding that the plant needs (and can) to increase production, Alex, Lou and Ralph meet with Johnny Jons to explore new sales opportunities. Jons has a pending order that the plant can accept and is above variable cost of production. Alex realizes he has learned to think for himself which was the outcome Johan had hoped for when he stopped providing advice. Thanks for summarizing the idea in that book. Didn’t quite understand when I first read that book.